Katie Wagner from Moonlight Bindery. If you want to meet her in person you have to go to Alexandria, VA in the metro Washington, D.C. area. "Moonlight Bindery", what a romantic name. Can you explain why you picked it? I work as a book conservator in private practice by day and a bookbinder at night. That sounds like a life full of books. Yes, all my jobs revolve around books. I have worked as a librarian, book conservator and bookbinder. I have a degree in Library Science and am bench trained as a book conservator. I trained with Tom Albro, former Head of Conservation at the Library of Congress. I have Professional Associate status with the American Institute for Conservation. I am also an avid reader (go figure) and am active in a very fun, very D.C. book club. Could you walk us through your typical workday? I wake up at 6:30 and rush around getting the kids up, fed and to the school bus by 7:15. After that I have my coffee and read The Washington Post for about 20 minutes then I head down to my studio. I usually work until around 1:00 then am off to the Post Office to mail Etsy orders. Then it is back home for a quick lunch and then I pick the kids up at 2:30. After dinner and the bedtime ritual I sew my books made from LEGO® base plates while watching Tatort or SOKO Wien with my German husband. I checked out a book from my college library, Bernard Middelton's The Restoration of Leather Bindings, and was fascinated. After graduation I moved home to D.C. and found a class at the Smithsonian on bookbinding and a job at a bookbinding supply store. I love making things from materials that fascinate me whether that is paper made from kiwi seeds, hand marbled paper, LEGO® pieces, or chalkboard cloth. I make travel journals, photo albums, wine journals and print designs (with my Gocco printer) on Moleskines®. Many of my books are case bound (and thus look like what people usually have in mind when they think of books). I enjoy combining different papers and cloth for different effects. 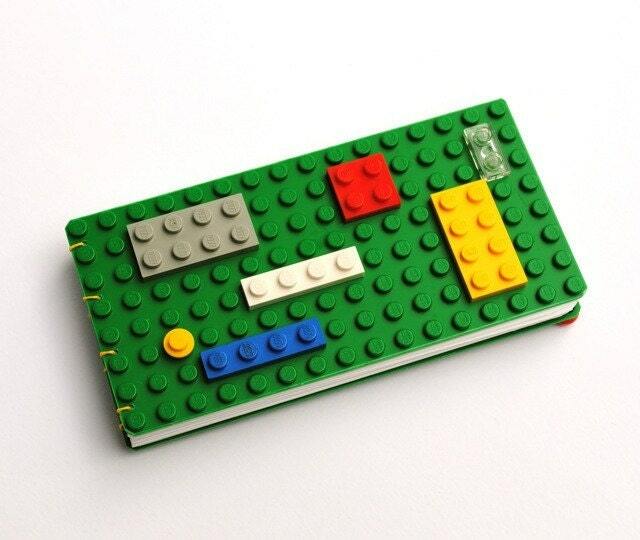 For my books made from LEGO® pieces I do a Coptic binding which has an exposed sewing on the spine. It is relaxing for me after a long day to sew these colorful books. I always have a smile on my face when I make them! I find inspiration in paper stores, fabric stores, my kids toy bins. I'm always looking and thinking of new ideas. I have too many ideas and too little time. What part of the process of making a book do you like best? And why? Choosing the materials of a case bound book appeals to me. Mixing and matching paper and cloth until I reach the desired effect is so much fun. With the Coptic bound books the actual sewing is my favorite part. Which of your books do you treasure the most? Time management! It is so easy to be distracted working from home. There is always something pulling you away. I have some new products I hope to have out in the spring - cool one of a kind journals that will incorporate some of the piles of vintage images I have collected over the years. I want to try and snag a BUST Magazine ad through Etsy next year. They are hard to get but I have been a long term reader of BUST and think my work fits with their readership. That sounds promising! Thank you for taking your time for this interview. If you missed the link above: Find the Moonlight Bindery here and have a closer look at all her inventive, professionally made books.